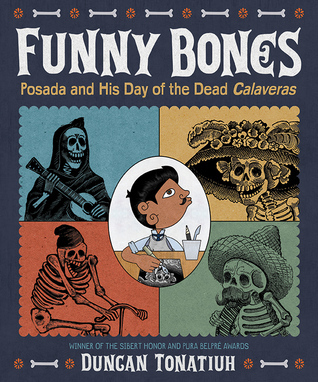 Funny Bones: Posada and His Day of the Dead Calaveras was recently featured in our list of Best Nonfiction Books of 2015. The picture book biography introduces readers to an influential Mexican artist who began his work as a printer. Jose Guadalupe Posada worked as a printer and engraver in Mexico City in the late 1800s. He was known for illustrating political cartoons. Posada's calaveras became popular when he illustrated the poems for a local newspaper for Dia de Muertos (Day of the Dead). Calaveras are images of skeletons associated with Day of the Dead celebrations. Most of Posada's drawings were humorous and meant to celebrate life, yet when revolution broke out the artist used his pen to criticize leaders of the Revolution. Author and illustrator, Duncan Tonatiuh, eloquently incorporates Posada's artwork into the illustrations in the book. The combination of Tonatiuh's cartoon-style illustrations and Posada's black and white etchings are the perfect blend of the present and the past and capture the comical and political nature of the calaveras. On three pages, Tonatiuh breaks down Posada's printing and etching techniques into step-by-step instructions that clearly explain to young readers how Posada created his artwork. Posada's work influenced many great artists such as Diego Rivera; his work can be viewed in museums across North America. Don't miss the rich back matter in the book including a detailed author's note, glossary, bibliography and list of museums where Posada's work can be seen. 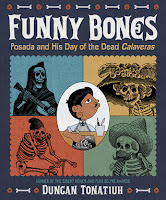 Funny Bones is an interesting story of an artist most students probably have never heard of before. The picture book can be used as an introduction to an artist study in art classes or in Spanish classes studying Day of the Dead. 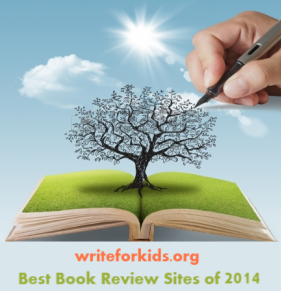 Posada's etchings may even inspire readers to create their own calaveras to celebrate life. Be sure to check out Separate is Never Equal by Duncan Tonatiuh. The reviewer borrowed a copy of the book from the local library.